In a ground-breaking departure from existing works, almost all of which are how-to manuals based on anecdotal evidence, this is the first academic textbook on fund raising. By integrating practical knowledge with social science theory and research, it presents a comprehensive approach to the function, from its legal and ethical principles to the managerial process by which gifts are raised. Territory previously uncharted in the literature is explored, such as the historical and organizational contexts of contemporary practice. Explanations of programs, techniques, and publics introduce a new system for understanding fund raising's major concepts. Unlike efforts in established fields, most of the material represents original scholarship undertaken to produce a first-time text. The book's main purpose is to teach students about fund raising--a high-demand, high-paying occupation that will continue to expand into the 21st century as the need for trained practitioners exceeds the supply. During the last decade, fund-raising education moved into the formal classroom and away from an apprenticeship tradition of senior practitioners mentoring newcomers. Yet until now, there has not been a textbook to support this evolving professionalism. Faculty have been reluctant to define fund raising as an academic subject in the absence of a theory-based teaching resource, and courses usually have been assigned to part-time instructors hired from the practice. This textbook addresses the void. It is designed for graduate and upper-level undergraduate courses dealing with fund raising as a primary or secondary subject. Among its features, each chapter points out research gaps and opportunities--such as problems and theories for master's theses and doctoral dissertations--and ends with a list of suggested readings. The text is appropriate for the diverse academic areas in which fund raising, nonprofit management, and philanthropy are taught, including public administration, management, arts and humanities, education, social work, economics, and sociology. Because of its public relations orientation, it is particularly suited for courses offered in that discipline. Additional audiences are practitioners enrolled in professional development programs; CEOs, trustees, and others interested in self-study; and scholars who need serious literature on the subject. PROFESSIONAL PROMO PIECE COPY..............Recently, the field of fundraising seems to have taken a giant step backward. Rather than conducting principled efforts to support common political, educational, financial, or social causes, the entire process is making headlines as a venue offering opportunities for influence peddling, corruption and self-promotion. The need for a guide to ethical fund-raising management is greater than ever. Effective Fund-Raising Management addresses this need. The most successful fundraisers understand why certain practices are more effective than others. What works in one situation may not work in another similar--but slightly different--situation. That is why theoretical understanding is vital to fundraising professionals. To be an expert practitioner, one must have have enough theoretical understanding to adapt one's practice to a variety of situations. That is the purpose of Effective Fund-Raising Management--to provide the underlying theoretical and conceptual understandings that enable an effective practitioner to become an expert practitioner. * examines four of the major methods of fund raising-- annual giving, major gifts, planned giving, and capital campaigns. Contents: The Function of Fund Raising: Introduction and Overview of the Book. Part I: The Practice. Parameters of Fund Raising. Fund-Raising Practitioners. Professionalism of Fund Raising. Part II: The Principles. Organizational Context of Fund Raising. Legal Context of Fund Raising. Ethical Context of Fund Raising. Theoretical Context of Fund Raising. Part III: The Process, Programs, and Publics. The Fund-Raising Process. Fund-Raising Programs: Annual Giving. Fund-Raising Programs: Major Gifts. Fund-Raising Programs: Planned Giving. Fund-Raising Programs: Capital Campaigns. Donor Publics: Individuals, Corporations, and Foundations. "Because it includes much original research as well as extensive references & a section on recommended reading, it's also valuable for practitioners--whether in their professional work or as volunteers." "This reader is grateful for the author and subject indices....The book is well-organized in three major areas: Practice, Principles, and Process....This book is a fascinating 'must-read' for anyone connected in any way to fund raising." 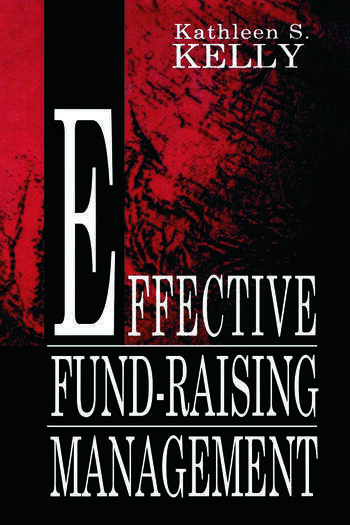 "The book Effective Fund-Raising Management by Kathleen S. Kelly is a comprehensive fund-raising text addressing the history of fund-raising, the theories behind its practice, as well as practical information description of modern fund-raising, including its strengths and weaknesses. It is highly detailed and in-depth, making it most appropriate for graduate students and professionals with pre-existing fund-raising experience." "As an early adopter of Kelly's book, I strongly recommend it to others who are interested in teaching fund raising. It gives students a thorough and insightful framework for understanding this specialized career area." "Kelly has produced the textbook we needed for our senior-level course on fund raising. The broad scope of subjects covered provides a panoramic view of the field, while the in-depth historical and analytical treatment of important themes makes this book useful for advanced studies. Whereas our undergraduate students like the practical applications of various solicitation techniques, graduate students are attracted more by the models and theories that give fund raising a foundation of serious intellectualism." "...an invaluable contribution to fund-raising education....As a comprehensive survey of virtually all previous literature relevant to fund raising, it defines the knowledge base of an effective fund-raising professional and will serve as a baseline reference for scholars, teachers, and practitioners....In 40 years the book will be referred to as a landmark publication." "Experts are hailing it as a landmark achievement, the first textbook on fund raising to go beyond a traditional how-to manual....Dwight F. Burlingame, associate executive director of the Indiana University Center on Philanthropy, says, 'This is one of the most important books that's come out in fund raising. It has the potential to change the way we think about fund raising.'" "A textbook such as this has been sorely missing from our discipline. When I earned my master's degree in Philanthropic Studies in ...1995, we students photocopied zillions of pages from reserved books and articles to compensate for the lack of one good resource. Effective Fund-Raising Management is a marvelous milestone." "More than the first basic textbook, Effective Fund-Raising Management is the presiding treatise on our subject available today. What a splendid addition to our body of knowledge!" "In the years and decades to come, thousands of people will be indebted to Kelly for the dedication and commitment that led to this book. It is the most comprehensive single volume about philanthropic fund raising that has been written to date, weaving the threads of history, ethics, legal issues, theory, and practice into a complete cloth that portrays the field. Seasoned practitioners, researchers, teachers, and students will all benefit from Effective Fund-Raising Management." "For the last 44 years, Effective Public Relations has defined public relations for this century; I believe Effective Fund-Raising Management will define fund raising for the next century." "Effective Fund-Raising Management is excellent. Kelly does a wonderful job of integrating theory, previous research, and her own research with the practical techniques and approaches used in public relations....I hope that the book stimulates the development of fund-raising courses in public relations programs throughout the country and the world." "...Kelly has accomplished a mammoth task in her new book, Effective Fund-Raising Management, by integrating the theory of fund raising with how to do it. One is led through an understanding of the history and practice of fund raising through the programs and processes and publics of fund raising to one of the most extensive reference lists currently available. An effective text for students of fund raising. "Every once in a while a book comes along that makes people seriously rethink some topic. Kelly's Effective Fund-Raising Management will do that. She merges a ton of common sense, a keen understanding of best practices, thorough knowledge of the relevant research and theory, deep insight into ethics, mastery of legal requirements, and an imaginatively accurate vision of what fund raising must be to succeed.... If it were a trivialized discipline before this book was published, it no longer will be." "Effective Fund-Raising Management marks the dawning of a new era in development: Now that we finally have an academic text and a theory base, the legitimacy and importance of our work moves to a new level. With every turn of the page, I learned something new. Kelly dispels many widely held myths and tells us why we do what we do. If this book had been available to me years ago, I'd be far ahead of where I am today." "For the first time, effective practice grows from basic research. (Effective Fund-Raising Management) provides a theory-based foundation for making reasoned judgments about fund-raising practices and programs...It is a text for students at all stages, from those just seeking careers in nonprofit organizations to senior professionals. Its strong base in theory is linked directly to rich descriptions of fund-raising practices, making it a valuable resource for all." "...impressed me as an ideal text....Fund raising has been taught exclusively by practitioners on the basis of how it has been done instead of how it should be done and should be founded on theory. I believe your text now makes it possible to teach the subject properly. And students will enjoy it. I read it like a novel in just two weeks!" "I am having an absolute ball with my Fund Raising and PR class--thanks to your superb book!" "True professions base practice on an intellectual body of knowledge, and--for the first time--Kelly has written a textbook on how to practice fund raising that is based on such a body of knowledge. Effective Fund-Raising Management makes available an outstanding text for existing courses....I hope it also will stimulate the development of new courses on fund raising at universities that have doubted the intellectual content of the discipline."